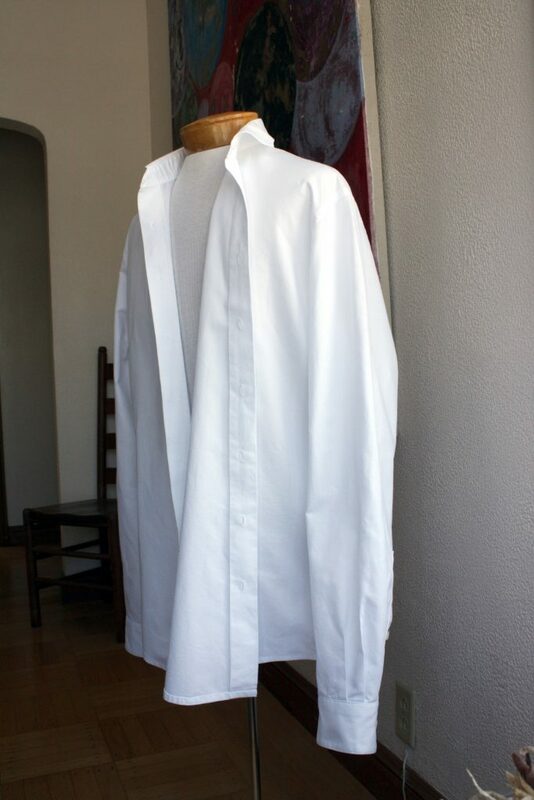 I’ve been devoting so much time to my Tuxedo Shirt project that I haven’t had time to blog as I go. I’ll fill in more details after the job is done, but here’s an update in the interim. 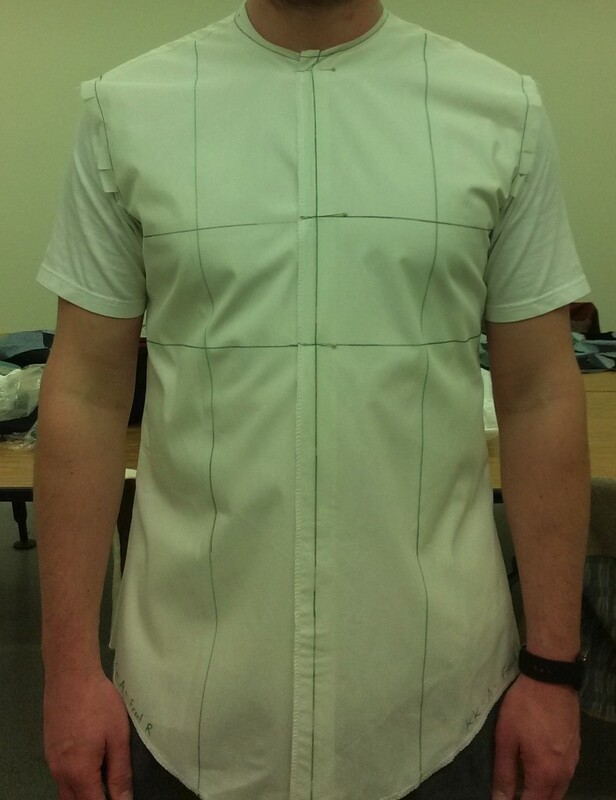 After several rounds of fitting, the good news is that I’ve arrived at a shirt pattern that fits the client. I got a trial-by-fire lesson in sleeve fitting, which I had not had a chance to practice on myself before trying out on the client. 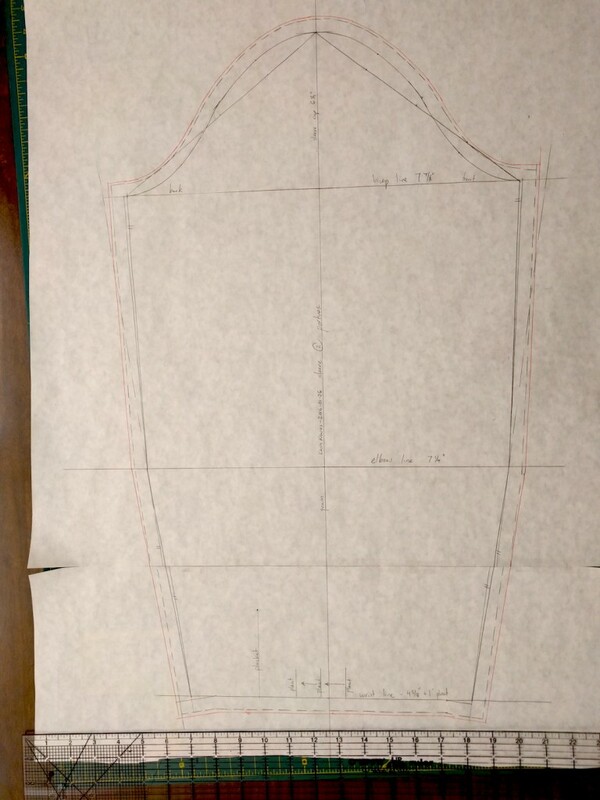 After draping the muslin and tracing out the client’s armscye directly on the muslin, I drafted a new sleeve to match. I started by making a new sleeve pattern, using a draft I learned in Paul Gallo’s patternmaking and design course I took in January. Contrary to the original sleeve that came with the model shirt, and also contrary to many men’s dress shirts, I used a much higher sleeve cap based upon measurements from my client. Here’s the first sleeve draft that I produced; it was a little tight around the bicep and the wrists because I didn’t get the measurements right. But you get an idea of the overall shape of the sleeve cap. The solid pencil is the stitching line, I added both 1/2 inch (dashed) and 5/8 inch (red) seam allowances. This entry was posted in Clients, Shirts and tagged tuxedo-shirt on March 26, 2016 by mportuesisf.